What is KoFax VRS Elite? Struggling with the quality of your scans, original documents not digitising in a clear and crisp way? This doesn’t have to be the case. KoFax VRS Elite is a powerful and feature rich scanner driver, compatible variations to support many document scanners, that has the capability to clear up or adjust the quality of the digital document during scanning that your existing scanner drivers just can’t match. Features include the ability to remove filing punch holes, staple speckles, to bring out the text that has been highlight over, enhance the text on NCR paper and produce clear plain background documents where the default scanner drivers were picking up the fibres in the paper. With the enhancements to your scanned documents, at the time of the scan, KoFax VirtualReScan Elite saves you time and vastly improves on the readability of your scanned images, making it easier to enable your business to rely solely on the digitised documentation and no longer requiring expensive and time consuming manual re-scanning, data duplication or archival document retrieval. 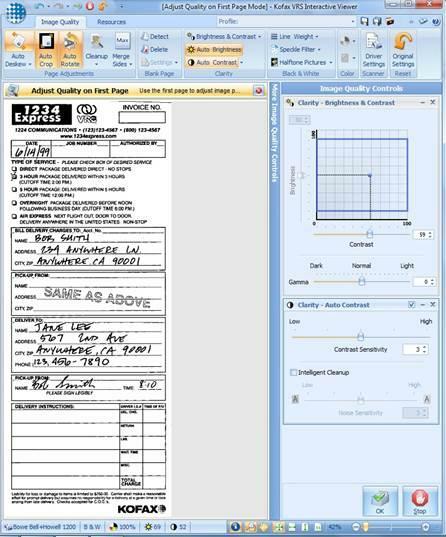 Just as easily, KoFax VRS Elite will continue to scan your clear quality documents so there is no need to be swapping between different scanner drivers, but if you find the need to have different driver configurations for KoFax, you can save numerous presets for the job types that have different requirements.